There is an old Zen story about a man who walks everywhere to seek for signs of spring in vain, and once he tires he returns home to find a bud on his plum tree. This tale is reminiscent of a teenager listening to the former mayor of Prince Rupert tell his graduating high school class that the North Coast is one of the best places in the world and he encouraged them all to leave, to travel and explore outside that place to realize that. So he left. Brooke became a welder, and moved to Alberta. After a couple years of work he travelled the world. He found himself on the top of a mountain in Vietnam, in the Scottish Highlands overlooking a loch, and in the Amazon rainforest in Guyana, yet nothing compared to his home — Prince Rupert. 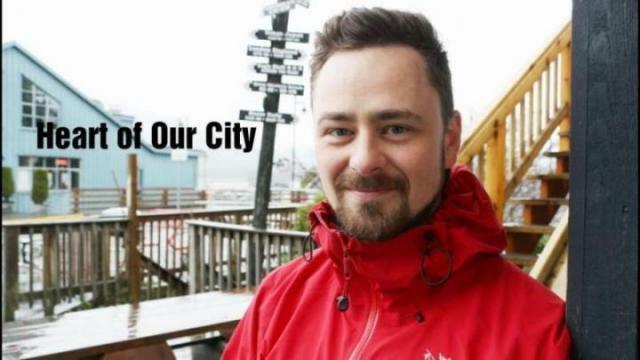 The current president of the Prince Rupert Ground Search and Rescue (SAR) team now feels quite content staying in the city he grew up in and helping it flourish. His adventurous roots began in the womb. His father had a fishing boat that was built in 1914 and when he tried to get his licence to fish, the Department of Fisheries and Oceans gave him one that was only viable in the northwest. His mother was in Victoria while his dad cruised the shores of Haida Gwaii. The two had met nine years prior and remained in touch. At last, she took the leap of faith and joined his dad on the fishing boat and not long after Brooke was born. “Her water broke in the wheelbarrow up the wharf to the hospital and then she went back in the same wharf wheelbarrow back down to the boat about two days later,” Brooke said. She toughed it out in their rugged lifestyle but after a year on the island, his mother had enough and they moved to Prince Rupert. Brooke’s father had two more children after that — totalling 10 offspring. They built a large home near the seaplane base, which Brooke lives in now with his wife Rebecca. Growing up in Prince Rupert, his father was the president of the Canadian Coast Guard Auxiliary for the Pacific Region, which spans the coastlines of B.C. and the Yukon. He took the welding program after high school and planned to find a pile-driving job in the area. Rather than wait for a job in Prince Rupert, he packed up and went to Alberta where there was plenty of work. For the next two-and-a-half years he lived with his grandparents in Brooks, and was able to spend quality time with his grandfather before he passed away. Travel came next. He has been to 12 countries, including three months in Guyana, a month in Vietnam, Thailand, went to a five-day wedding in India, and visited his sister in England and ended his around-the-world tour in Scotland. “The more I travelled I’d just be homesick every time. I’m glad I left. Now I know I don’t need to leave ever again. This is it,” he said. Brooke returned to Prince Rupert completely content to stay in the place he grew up. The outdoorsman finds enough to tour in the surrounding area. He planned a canoe trip with friends last summer and spent four days exploring the Moffatt Islands. Then he met his wife Rebecca. The couple were in band together at high school, although Brooke was a few grades her senior. They met up nine years later at Seafest and started dating. Not long after, he found a job in Edmonton as a pipe welder on the tar sands. He travelled between the two cities for a few months but then quit, returned to the North Coast and was soon married to Rebecca. The welder now works for Broadwater Industries and he’s volunteered with Ground SAR since it’s re-integration in 2013. He was temporarily involved after high school as well and knows the keys to ensuring the success of today’s group. This is his first year as the president. He oversees all the task forces. “It’s always a team effort or the organization will crumble,” he said adding that the volunteer group this year is strong and dedicated. “I love this community. I want to see everyone succeed in this town, whatever they’re passionate about,” said the man with many passions, who found his plum tree in full bloom when he returned home.